Help make space for artists. Donate to Mount Tremper Arts. The stakes have always been high for the risk-takers, those who dare. Our artist community has long recognized that experiment leads us forward, and for more than 10 seasons Mount Tremper Arts has supported those who provoke and invent. Now that the stakes are greater than ever, we hope you will support this creative laboratory by making a contribution. Let’s make sure these artists always have a place to go. At MTA's 10th Season Gala, we thanked co-founders Mathew Pokoik and Aynsley Vandenbroucke for making space for artists - not just physical space, but empty space by imposing few restrictions, intellectual space through dialogue, and emotional space from their nurturing support and advocacy for so many years. Now, after 300+ artist residencies and 145 public performances, this space they built 15 years ago is fortified by a community that understands why artists should experiment, and why we should care that they do. Thank you for being a part of this community. 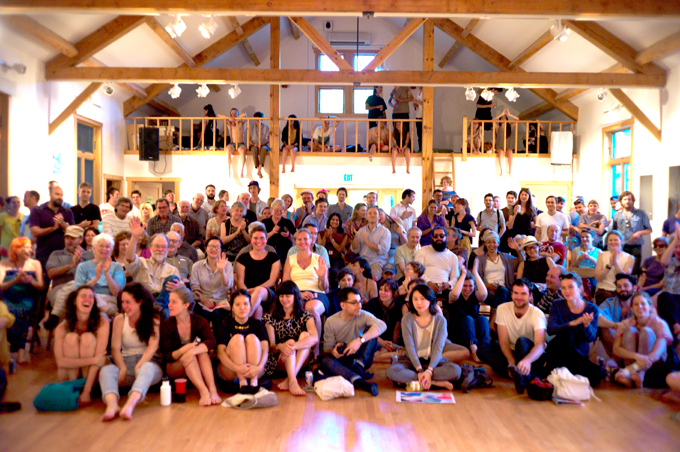 I hope you are able to help artists create new work by making a gift to Mount Tremper Arts. Being a donor comes with Member Benefits, like ticket passes, invitations to artist dinners, and goodies from the garden. Check it out! For wire or stock transfer information, contact Crystal (crystal [at] mttremperarts.org or 845-688-9893). Does your company have a Matching Gift program? Ask your employer for information on how to double your gift. Volunteer your time and talents: Spend a week on site, stop by to help garden, or become an ambassador by hosting a fundraiser on social media or forwarding a link to donate. Planned Gifts (like leaving MTA in your will or as a beneficiary of your retirement plan) delay your gift and help MTA stay sustainable in the future. Mount Tremper Arts provides approximately 40 residencies each year, and will serve 190 artists in 2018 across disciplines, genres, career stages, demographic identities, and many for the first time. Public Performances, Workshops, and Open Rehearsals engage new audiences to experimental performing arts. This often includes fellow artists, community members with little to no familiarity with contemporary performance, and families. Community matters. Your involvement is a demonstration of support for risk-taking, experimentation, and the artistic process. MTA is a 501(c)(3), tax-exempt, not-for profit organization. Your contribution is fully tax-deductible to the extent of the law.